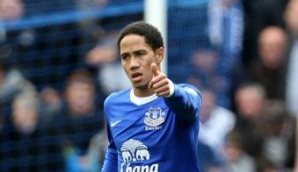 Steven Pienaar’s early goal was enough for Everton to eke out a 1-0 Premier League win at home to Fulham. The South African finished a fine team move just after the quarter-hour mark of a first half the home side dominated, although they seemed to tire in a closer second period. The Toffees stepped up their game in the closing stages, almost grabbed a second but were enied by some good goalkeeping and poor finishing, including a dreadful miss from Marouane Fellaini. It mattered not in the end as, shorn of Dimitar Berbatov after an injury in the first half, Fulham offered little in the final third. Everton held on for a win that cements their hold on sixth place and puts them three points shy of fourth.